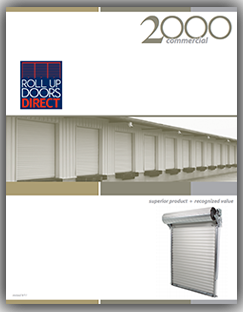 The Model 2000 Standard Commercial Sheet Door offers special features for commercial installations. Model 2000 has the deepest guide engagement in the industry and universal fastening guides. With the Model 2000's durability and low maintenance, this door is sure to have an unequaled quality and value. This is not a Wind Load door. **Please note that all of our doors are made to your opening size - If you don't find the size you need please call us at 1-877-357-DOOR Today! 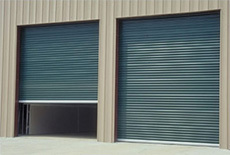 The 26 gauge corrugated door curtain is manufactured from full hard galvanized grade 80 steel and coated with Super Durable polyester paint that is backed by a 40 year film integrity and 25 year no-fade limited paint warranty. Available in sizes up to 12’0” x 18’0” and in over 20 different standard colors. 12” diameter drums allow for lower headroom requirements. An enclosed barrel houses the dead axle assembly and protects the factory lubricated springs from direct contact with environmental elements. The inherent strength provided by the spiral barrel minimizes axle deflection providing smoother operation. Because the curtain is attached by screws and not seamed to the barrel, replacement of either independent assembly is cost-effective, quick and easy. A reduced drive chain hoist allows for smoother operation on doors over 10’0” wide or 10’0” tall. Convenient spring tension adjustment is accommodated by inserting a common 1/2” ratchet tool into the end of the drive shaft and rotating. Initial loading of the door tension can be easily accomplished with a ratchet without the difficulty of spinning the door. This innovation also allows the tension to be easily measured and managed with a torque wrench. Universal mount 4” deep 16 gauge galvanized steel guides require no pre-installation modifications for wood, steel, concrete or masonry block applications.